Loch Lomond, in Scotland, is the largest freshwater body in the British Isles. The Trossachs and the Earldom of Breadalbane, nearby, are soaked in Scottish history and the romance of literature. This is Rob Roy country, an inspiration for the novels and poems of Walter Scott. It is also a place for a wonderful outdoor vacation with sparkling lochs, dramatic glens, national forests and fjord-like sea lochs. Have a look. Then consult Loch Lomond and The Trossachs at a Glance - A Quick Guide to the National Park, with links even more features about the area. On Loch Lomond's eastern shore, Ben Lomond, at 3,196ft, towers over the loch. Walkers skirt its slopes on the West Highland Way. Several companies operate cruises that slip around the many islands and between the steep banks of the UK's biggest freshwater body. The Loch Lomond Golf Club, near Luss, is beautiful and exclusive - only members and their guests can play. But there are quite a few other lovely golf courses nearby that welcome visitors. Find out more about teeing off in the land where golf was invented. The Inversnaid Hotel, on the north east coast of Loch Lomond, has its own pier. 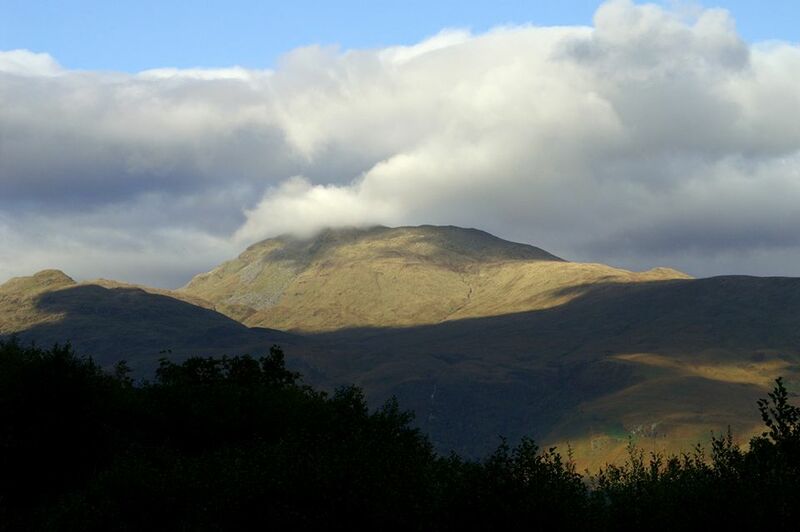 It is popular with groups and walkers on the West Highland way. The hotel has 65 acres of wooded grounds that include Rob Roy´s Cave and Arklet Falls. The ruins of Inversnaid Garrison, mentioned by Sir Walter Scott in his novel about Scotland's "Robin Hood" - Rob Roy, is nearby. During the summer, some of Loch Lomond's cruise tours stop at Inversaid to visit the waterfall and cave, picnic or lunch in the hotel. On the edge of Breadalbane, above Balquhidder, where Rob Roy MacGregor is buried, the countryside begins to climb. The S.S. Sir Walter Scott cuises Loch Katrine in the Trossachs. This loch is rich with literary and historic connections. Rob Roy MacGregor was born on Loch Katrine and Sir Walter Scott, for whom the loch steamer is named, visited often for inspiration. His novel Rob Roy and his long poem, The Lady of the Loch were inspired by visits to Loch Katrine. Read more about cruising Loch Katrine. The busy market town of Callander, on the River Teith, is a main northern gateway to the Trossachs. The Maid of the Loch is the last and the largest of the great paddle steamers built to navigate Scotland's lochs. Today, as volunteers work to restore it, it rests at Balloch Pier. Visitors are welcomed aboard for its museum and cafe. The steamer is also a venue for weddings and parties. Rob Roy's Grave - "MacGregor Despite Them"